Gratis NOLA! : Happy Thursday with a Stroll Down Royal and Concerts 'Round Town! Happy Thursday with a Stroll Down Royal and Concerts 'Round Town! What a beautiful evening for a stroll on Royal! - For, wine, food and more wine!!!! Having fun on Royal Street! 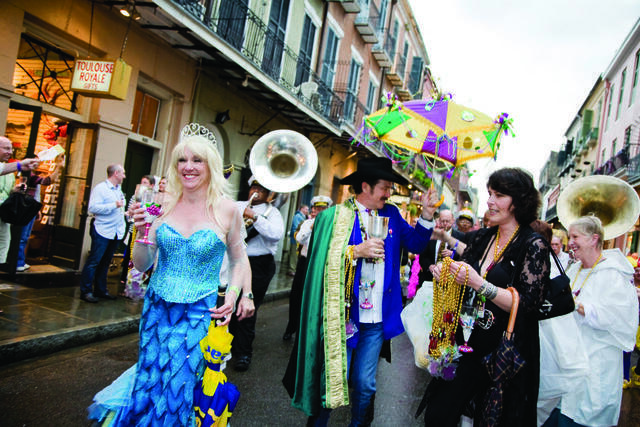 This evening is the Royal Street Stroll and the fun starts up at 5:30 pm and goes until 8:30 pm! Enjoy amazing food and wine as you stroll from the 200 block to the 900 block of Royal Street. The Wine and Food Experience Event brings together New Orleans' greatest gifts: antiques, fine art, live jazz and stunning historic architecture with the world's outstanding wines. Shop the enchanting galleries of Royal Street while experiencing wine at each stop, as live jazz music fills the air. 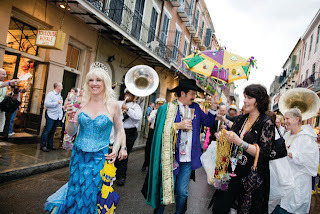 As always, the Krewe of Cork will parade down Royal Street! At the event, in exchange for your ticket, you will receive a 2013 Wine Glass & Wristband that allows you receive wine & food offerings. Tickets are $89 per person in advance ($109 on-site), available at NOWFE....Don't miss out on all the fun!! It's a beautiful night to hang out at City Park and enjoy singer/songwriter/guitar playing man - Alex McMurray for the Twilight Garden Concert Series! The gates open up at 5:00 pm and the performance starts at 6:00 pm in the City Park Botanical Garden Pavilion of the Two Sisters...There is an admission charge, but hey, it's helping the Park out...$10 for adults and $3 for children. Need a little art, culture and music? You gotta go to the show at the Ogden Southern Museum of Art (925 Camp St.) - better known as Ogden after Hours. Tonight the Ogden has the Seth Walker. Now based in New Orleans, Seth Walker was raised in rural North Carolina surrounded by a musical family. His interest in music was influenced by his parents, both classically trained musicians. Seth began playing the cello at the age of three but eventually fell in love with the guitar. Once Seth was introduced to the blues by his uncle, he began to trust his own voice and his desire to express himself through music. Be sure to head on over to the bar for this month's signature drink - Mint Julep - *Remember with your Ogden membership all of these excellent concerts are FREE!!! Jazz in the Park Free Concert Series continues in Armstrong Park! PUfAP is proud to present the third season of Jazz in the Park, inside of the historic Louis Armstrong Park. The events are FREE, begins today and runs from 5:00 to 8:00 pm through June 13th featuring a Marketplace that provides an opportunity to purchase fresh food, produce and craft market available to the public from 3:00 to 8:00 PM. Check out the great line-up of music below! The Live at Lafreniere Park Concert Series continues this evening at the Park Pavilion with Mojeaux at 6:00 pm. Bring your lawn chairs, blankets, etc. and enjoy an evening of live music in the Park and best of all it is FREE! !